It's kind of hard to see this and the chart from your last post about this as describing the same numbers. Is it all in the break points and adjustment for family size? Of course you do see the golden rich bar on the top, but if you look at poor you will notice that, that has increased by a similar amount since the 2005 low. It isn't as large an increase as 2010, but it is still too early to see if this is a long term upward trend. I suspect that much of the increase in the upper classes is due to the increase in dual-income households. 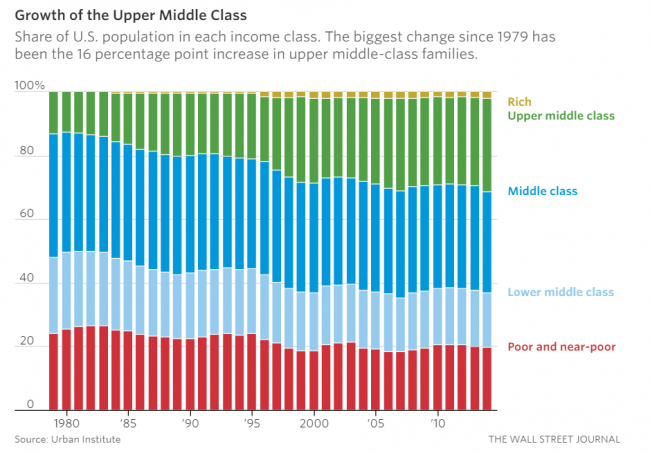 It's also not getting backfilled by people moving up from poor and lower-middle class. I see a likely problem with your graph. It is very probably based upon household "income" levels, and so is distorted by government benefits and transfer payments. In reality, what should be compared is the "effective" income that defines their standard of living. You will find that the number of so-called "poor" people shrinks dramatically. When you can afford a new car, big-screen TV, and regular meals out, it's hard to argue that you are living in poverty. In other words, your graph still understates the number of people who have escaped the poverty lifestyle. The biggest switch to dual-income households took place from the mid 1960s to early 1980s... it's actually been in slight decline recently (I was lazy in Googling for a chart - better ones may exist). This graphic is absolutely horrible. I realize that you did not produce it, but the information could readily have been presented in a manner much, much easier to interpret. In a country where the cost of living varies enormously from one area to another, is such a chart worth much? I suspect that the income that might make one upper middle class in Idaho wouldn't cut the mustard in NYC or SF. Yes. That chart is consistent with my perception. But there is a reason why we do not seen the boom in the pay level for dual-income families until the 1980s. Initially, when the wife started working outside the home, the pay level for her was low. Not only was she typically going after unskilled labor jobs, but also the glut of women now seeking those jobs depressed the wage level for those jobs. By the mid-1980s, more women were coming into the workforce with skills highly valued in the marketplace; plus the economy had absorbed the influx of new workers by then. What? You don't blame sexism in the workplace? Clearly, you need to be sent to a feminist re-edumakashin camp. It is possible that we would see more a decrease in the poor and near-poor if not for changing tax and credit policies. I suspect that the authors at urban Institute get their data from tax returns, but tax returns are influenced by policy. Both Reagan and Bush increased the incentives for the poor to file taxes -- even if they had income below filing requirements. By filing tax returns, the poor received tax credits that Reagan and Bush put into place; therefore we have more tax returns from the poor. Therefore the poor not previously counted now get counted. Also, these credits add incentives for people to hide income or recharacterize it so show lower income. It's down from the peak at about 25% in the early Reagan administration. And it's more than the median income in most of the world. Points well taken, but we have several sites showing this graph and saying everyone is getting rich, but totally ignoring the uptick in poor as well (per USA standards) I find it a bit disingenuous.